AAU Gymnastics is amateur gymnastics in the US. 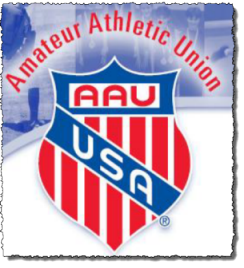 AAU stands for Amateur Athletic Union. AAU Gymnastics is a separate gymnastics league than USA Gymnastics. Generally gymnasts only compete in one league or the other in a given year. While traditionally most gymnastics in the US has been through the USA gymnastics league, AAU gymnastics has been gaining in popularity in recent years. You can find an AAU gymnastics club in your area here. How is AAU Gymnastics different than USA Gymnastics? USA gymnastics is the official governing body for gymnastics in the US. In general (and on this website) when discussing competitive gymnastics rules and regulations we are talking about USA gymnastics rules. AAU gymnastics’ goal is to let athletes compete and learn lessons and tools that will help them throughout life. USA gymnastics’ goal is to train exceptional gymnasts; one of their responsibilities is to train and select the US gymnastics teams for the Olympics and World Championships. Because of this, AAU rules are less strict ( designed more for fun and less for producing superb gymnasts) than USA gymnastics rules so the scores at AAU meets tend to be higher and the competitions more relaxed. When deciding whether to compete in the AAU gymnastics league or the USA gymnastics league you will want to consider what your end goal is for the sport. If your goal is ever to compete gymnastics professionally or on a college team, you will want to solely compete through USA gymnastics. If you are interested in just competing recreationally and want as relaxed an environment as possible, then AAU gymnastics might be for you.